I woke up earlier this morning, put the coffee on and enjoyed the morning silence. A few folks are just getting going around the barns at this time. After the horses were fed their oats, Rick was out on the local tractor pushing up the manure into one big pile. The kids got going with the chores. Cody and his girlfriend Allie arrived in the wee hours of the morning. So we scheduled to hook an outfit during track time. Things went according to plan. After I served my ham and egger breakfast buns, it was time for cleanup. 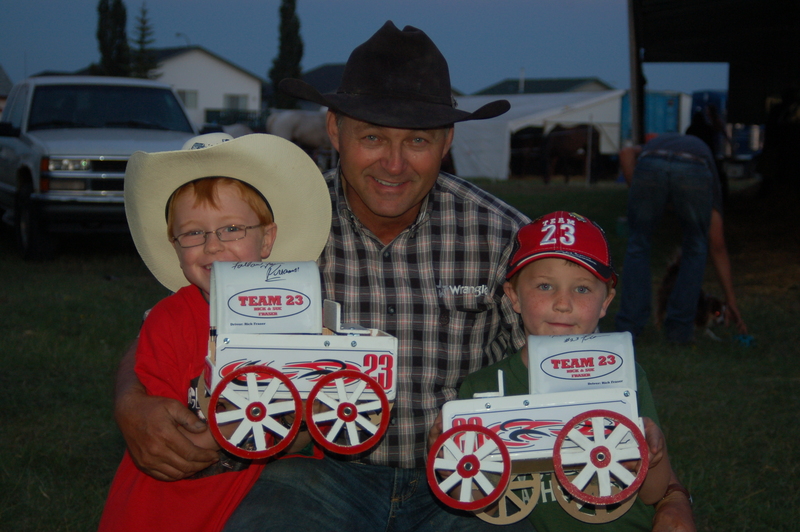 Shortly after, our friend and chuckwagon historian stopped by. Doug is collecting video interviews from different folks along the trail. 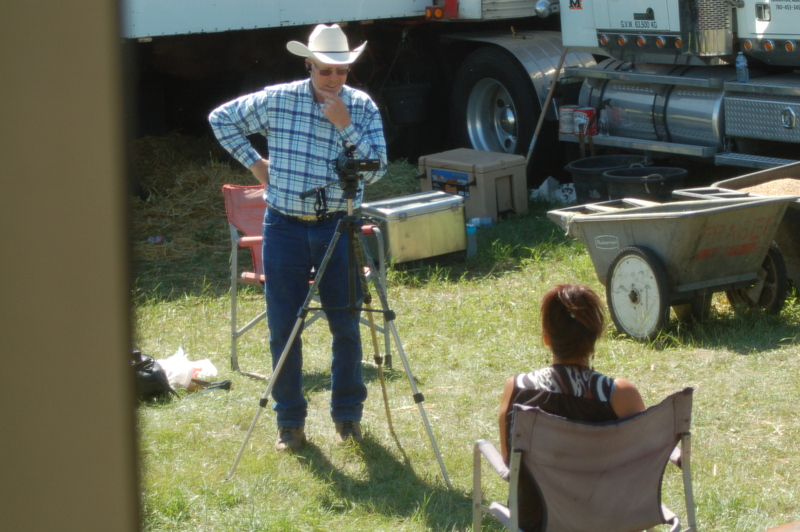 Doug interviewed me about life on the chuckwagon trail over the years and then also interviewed Rick. It’s fun to reminisce of days gone by. The rest of the day was pretty relaxing until I found I was having some issues with my computer. Pop-up viruses, that is. A call went out and Ed Wittchen, our WPCA President, came to the rescue. He came on by and with the aid of a friend in Calgary they got working on my computer to clean it up and install some protection. I think we got a good chunk of things figured out and I thank Ed a whole bunch for his help. 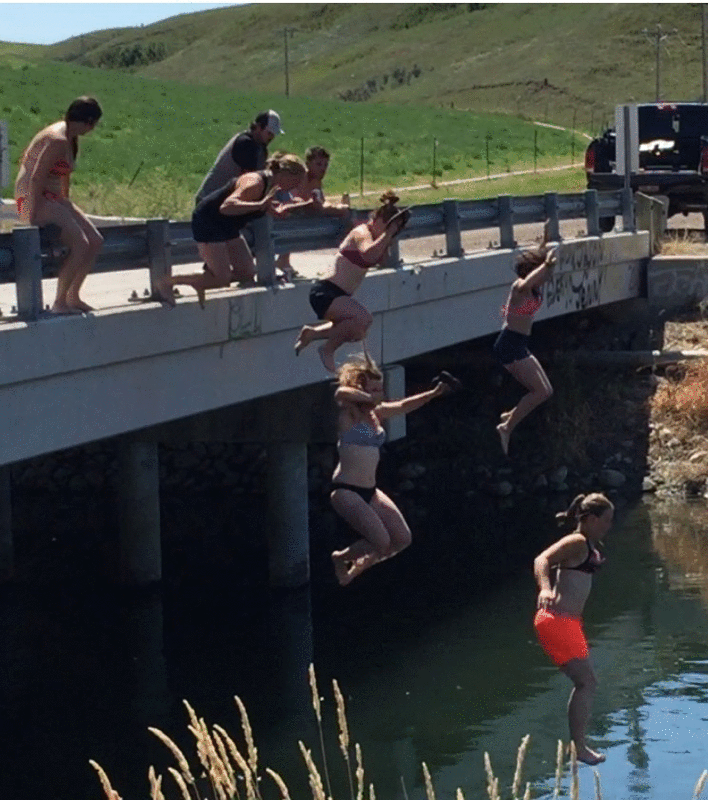 While I was dealing with that, the kids from Team 23 and other barn hands from the grounds headed out to the local cannal bridge for some jumpin’ fun! Yes, they were brave and jumped off into the water. They all came back, saying it was a blast. Oh, to be young and full of no fear again. As the first few heats got underway, some from our crew helped cousin Troy prepare for his run. 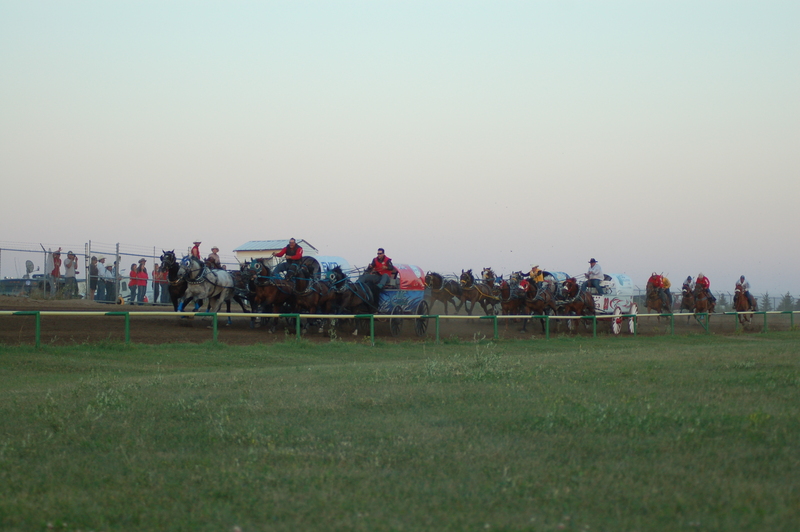 As we prepared our horses for the evening races, Law stood patiently waiting. 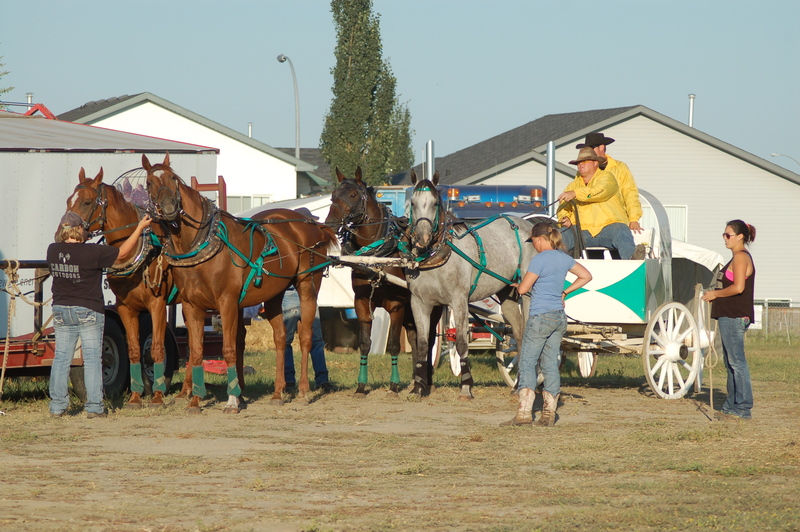 Our hook tonight off the 1 barrel was Spirit on the Left Lead, Spin on the Right Lead, Keenan on the Left Wheel and Zorba the big grey on the Right Wheel. Cole rode Beau and Dustin rode Tixter. These boys did a great job! When Rick came in and Cole went to grap the lines to put them straight, they went far over to the right. Rick was out of shape! The team was sucking to the right. 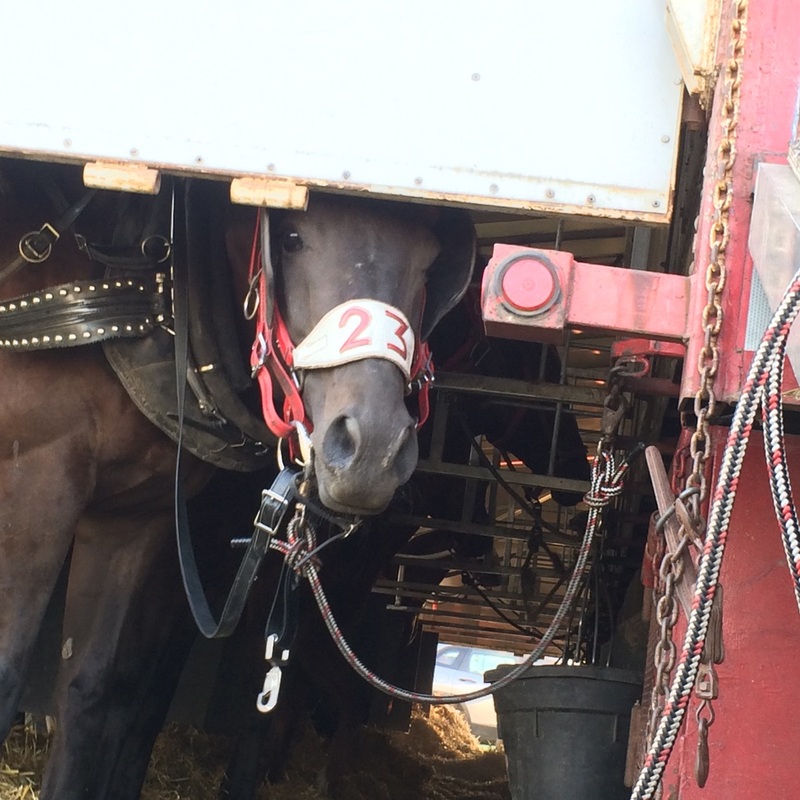 When the horn blew, Ricky managed to drive the team around the barrels in a clean state. Our time gave us a 14 on the day. Pretty respectable. Yesterday and today, the happy and lucky little recipients came by to say thank you with the big smiles on their face. What a joy this is for me to see. Sometimes we need someone to simply be there. Not to fix anything or to do anything in particular, but just to let us feel that we are cared for and supported. I want to thank you Sue for sharing your life on the wagon trail and also want to thank you for all of your very inspirational quotes. 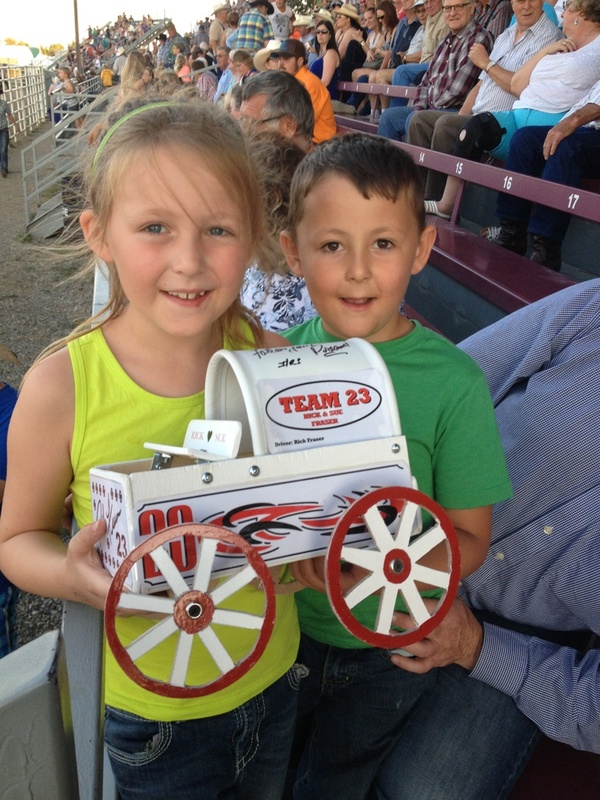 Keep up the good work and good luck to team 23 at the finals in Rocky. It is my pleasure sharing my journey with others. Thanks for following. Its always good to hear from our followers to hear how this blog has touched their lives.